Demolition and construction at West Hollywood’s Faith Plating site will begin much sooner than expected, according to a press release from developer Trammell Crow Residential. Trammell, which recently purchased the site at 7141 Santa Monica Blvd. at North Formosa, expects demolition of the sound studio and Faith Plating building to begin this fall and construction of its “Domain West Hollywood” project next spring. Residents are scheduled to move in spring 2016. The Domain project will be a six-story residential and retail building with 166 residential units and 9,300 square feet of retail space at street level. The building will be six stories high (72 feet) on the Santa Monica Boulevard side, but only three stories (36 feet) at the back of the lot, which is next to low-rise residential buildings. In May, at the meeting in which WeHo’s Planning Commission unanimously approved plans for the project, some residents worried there were too many big projects simultaneously going up on the city’s eastside. In response, Planning Commissioner John Altschul said the Domain project wouldn’t be “shovel ready” for several more years, reassuring residents two big Monarch Group projects would be completed before Domain broke ground. 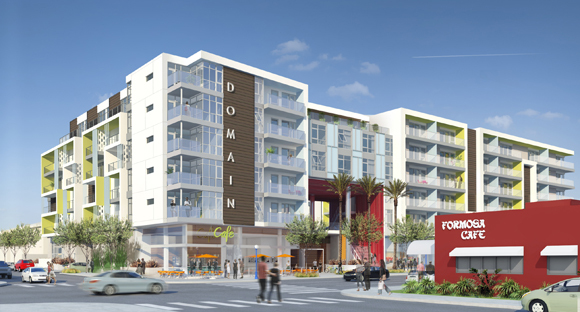 Monarch’s two projects are: A six-story mixed-use project at the old Carl’s Jr. site (on the northwest corner of Santa Monica Boulevard and La Brea Avenue) and another six-story mixed-use project on the old Jon’s supermarket site (southeast corner of La Brea and Fountain Avenues). According to Jeff Seymour, a lobbyist for the Monarch projects, the Carl’s Jr. site project should be finished in January 2014. Additionally, a mixed-used project that includes two seven-story towers and 26,000 square feet of commercial space is proposed for the Movietown Plaza site (on Santa Monica Boulevard at Poinsettia Place). At the May meeting, most of the residents who spoke favored the project but worried about the removal of soil contaminated by heavy metals used by Faith Plating, which since 1935 had been one of the world’s largest replaters of chrome automobile bumpers. At the meeting, Joe Frey, founder of Frey Environmental, the company in charge of removing the contaminated soil, said the level of contamination was not as extensive as once thought and there would be no spillage as waste was removed. The centerpiece of the project, which was designed by Alan Pullman of the Long Beach-based Studio One Eleven architectural firm, will be a three-story portal allowing views of the Hollywood sign in the background. That portal will have a bright red metal covering designed to tie into the red-painted Formosa Cafe, the Chinese restaurant directly across the street. The western division of Trammell has more than 1,500 apartment units in Southern California in development or recently completed. I’m sorry, but I totally disagree with Weho Guy. I hope he is being sarcastic. The East side is NOT very exciting now, it is totally being clogged up with more traffic than it can handle. Once these new projects are full, there will be total gridlock. They have removed a grocery store that was popular with my Russian neighbors, a Trader Joe’s that was popular with EVERYBODY with what? Apartments that nobody in the neighborhood can afford. Why aren’t any of these behemoths being built on the west side? All they get is new restaurants and bars and retail aimed at the gay population. I’ve lived here since before Cityhood and I’ve never been unhappier here. We do not need this new density on the east side. We need restaurants and retail (other than the gateway center) aimed at the population that lives on the east side (and not only Russians live here). @Snarkygal Actually, the westside is in for some mega projects. There is a big mixed use thing being built on the vacant lot where the old Athletic Club and The Palms bar used to be. And across from that, from the Ramada to West Knoll (Collar & Leash, West Knoll Pharmacy, etc.) all that is also being torn down for a gigantic mixed use project. The apartments will almost certainly be very expensive “luxury” digs. I can’t remember, but condos may be in the mix too. But it’s happening everywhere, not just the east end of WeHo. Isa, I’m happy you’re as enthusiastic as the rest of us. Don’t forget that Ralph’s on Fountain has just started on a total store renovation and the strip mall on SMB/La Brea is finally getting fixed up. Rite-Aid is also in the middle of a store renovation. East side is very exciting now! Keep packing them into the West Hollywood East end of town. Will we be saturated yet? No, the Movietown Plaza comes next! This is such great news! New residents, new businesses and no more Faith Plating. The neighborhood is thrilled with this project as proven by the amazing turn out to voice support at the various community meetings. I will continue to avoid this area of town as the current traffic and construction nightmare is only going to be worse for the foreseeable future. As to the toxic waste pit, well I’m glad it’s being cleaned up. I don’t think there is much we can do but trust the professionals to do the proper clean up and remediation. Then again, in the era of places like the Exide battery toxic site in Vernon, hard to trust either the government or private companies to do the right thing.